Adobe Flash CS6 offers the seamless import of Photoshop and Illustrator files with the Illustrator and Photoshop Import panels. Graphics created in these applications can be imported with ease and the highest quality possible, which is great news if Photoshop and Illustrator are already essential parts of your creative workflow. Using the Import panels, you can view, select, and convert Photoshop layers to symbols or keyframes or distribute them to Flash layers while maintaining common layer effects, such as drop shadows and blurs. Even with complex layered PSD files, Flash can import any .psd file while keeping individual layers editable, including type layers, most layer styles and even layer comps. 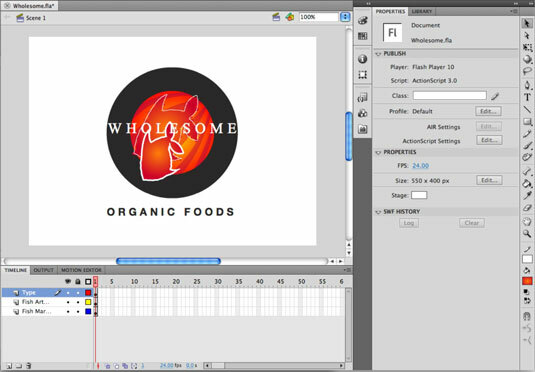 You can distribute Photoshop layers to Flash layers, sequence them as keyframes, or individually convert layer contents to symbols to be added to the library. When the Import dialog box appears, choose a Photoshop file from your hard drive and click Open (Windows) or Choose (Mac). The Import to Library dialog box appears with full Photoshop file import options and a full view of all layers in your file. 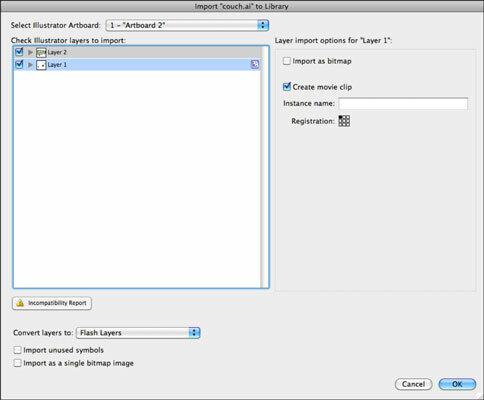 With the check boxes next to each layer, select the layers you want to import into Flash. 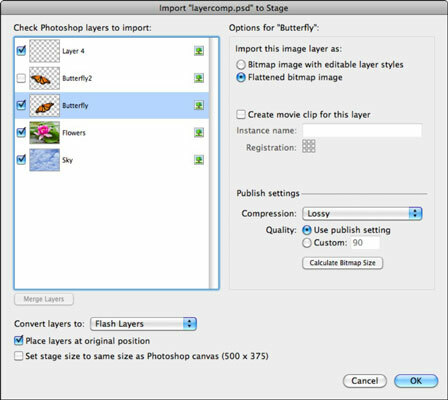 Now you can set options for how to import the contents of each layer. Highlight a layer you’ve chosen to import. You can choose from several options that appear on the right side of the panel. The artwork you selected appears on the stage. Because you can selectively import layers and merge layers directly from the Import panel, consider using .psd files instead of importing flattened artwork (such as JPEG or GIF files). This panel allows you to extract specific elements and maintain transparency from Photoshop layers. Importing .ai files is nearly identical to importing .psd files, with a full layer view and lots of options for converting and distributing artwork and type from Illustrator layers. Because Illustrator is natively vector (just like Flash), you can often continue editing imported artwork in Flash using the Subselection and Pen tools. In a new Flash document, choose File→Import→Import to Stage; choose an Illustrator file from your hard drive and choose Open (Windows) or Import (Mac). The Import to Stage dialog box appears with a full view of all layers in your Illustrator document. Select the check boxes for the layers you want to import into your document. Highlight each layer you’ve chosen for import to set options for each one. You can import each layer and individual path as either a bitmap or an editable path. You can import groups as bitmaps or movie clips. Click OK to import the artwork to the Flash stage. Check out the stage and the Library panel to see how your artwork was placed in Flash. Look for the Incompatibility Report button at the bottom of the layer view in the Import panel. This button can indicate potential problems that can prevent the artwork from importing properly into Flash. If you see the Incompatibility Report button, click it and read the warnings to address any pending issues before import.